Many cultures and communities around the world set aside a day to give thanks. In the United States, the first Thanksgiving was in 1621 when the Puritans, later called Pilgrims, arrived in Massachusetts. Since they arrived in December, it was too late in the year to plant much food. Their first winter was rough, and about half of the settlers died. To help the Pilgrims, the American Indians taught them how to plant crops like corn (a new food for the colonists) and how to hunt and fish. The following fall, the harvest was plentiful. To give thanks, Governor William Bradford and the colonists held a three-day feast with 90 American Indians of the Wampanoag tribe, including their leader, Massasoit. Together, they ate wild turkeys, duck, geese, venison, lobsters, clams, bass, corn, green vegetables, and dried fruits. But Thanksgiving was not an annual holiday right away. In 1789, President George Washington proclaimed the first national Thanksgiving Day on Thursday, November 26. Other presidents made similar proclamations, and many states began to set aside their own days of thanks. But it wasn’t until 1863 when President Abraham Lincoln declared Thanksgiving to be a national holiday. Today, Thanksgiving is on the fourth Thursday of November. Many people take time to visit family and friends who live far away. Some of the foods that we serve on Thanksgiving Day are similar to those eaten on the original Thanksgiving feast in 1621. Long before the days of computers, phones, and tablets, different cultures made their own fun and created games by hand. Many of these games, including the “hoop and darts” game, are still fun today. Native Americans across North America had different ways to play this game, but they all involved sending a hand-made dart, javelin or arrow through a hoop. Test your skills in our online game! Can’t get enough about Native Americans and their contributions to the United States? Check out our Native American Dollar Coin coloring pages to color your own Native American coin. Every year since 2009, the Mint has released a new design for the Native American $1 coin that highlights Native Americans and their contributions. 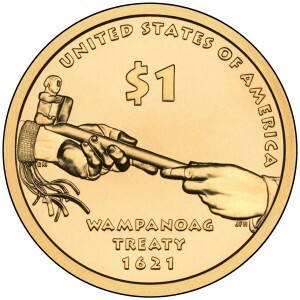 2011 Wampanoag Treaty of 1621: The coin highlights a peace offering made between the Wampanoag Indians and the settlers of Plymouth Colony, which laid the groundwork for the first Thanksgiving in October 1621. 2014 Native Hospitality to the Lewis and Clark Expedition: The coin honors the hospitality of Native American tribes who helped the Lewis and Clark Expedition to fulfill its mission. 2010 Great Law of Peace: The coin honors a historic peace treaty of the Iroquois Confederacy made up of five Native American nations that served as an example of democratic self-government and equality. Commemorative coins are marked with values like ordinary coins, but their buyers don’t usually spend them. One reason is that they cost more than their “face” (marked) value. The Mint produces them to help remember a special person, place, or event. 1920 Pilgrim Tercentenary Half Dollar: A commemorative half dollar celebrating the Pilgrims’ 300th anniversary of the landing of the Mayflower. 1937 Roanoke Island, North Carolina Half Dollar: This coin commemorates the 350th anniversary of the establishment of Roanoke Island, also known as the Lost Colony, the first attempt at founding an English settlement in North America. 2007 Jamestown 400th Anniversary Commemorative Coin: This coin recognizes the founding of Jamestown, Virginia in 1607. The survival of this colony is a major milestone in U.S. history. Students will understand and explain the terms “treaty” and “diplomacy”. Students will apply and extend knowledge of these concepts through fictional situations of character conflict. Students will identify nonfiction text features in a variety of materials, and will use nonfiction text features in their own nonfiction writing piece. Students will understand the purpose of treaties among Native Americans and settlers and will use their writing to better understand treaties. Students will sequence key events to understand the Pilgrims and the Wampanoag, then research the groups, create timelines, and make class presentations.